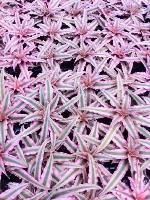 Pink Starlight is a Crypthanthus (which means hidden flower) and one of the mostly terristrial bromeliads. It prefers to grow in slightly moister conditions than Neoregelia or Aechmea and will stay quite small. What makes it special is it's great color. Good in minature gardens, habitats for frogs and makes a nice low table plant.